BMW 5 Series GT M Sport review | What Car? 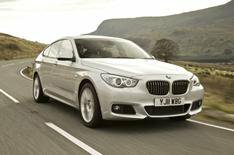 The BMW 5 Series Gran Turismo (5 GT) is an unusual mix of SUV and premium hatchback that has so far failed to sell in big numbers. That could be about to change, though. For a premium of 3300, you can now have the car in BMW's M Sport trim, which is a popular option on its other models. For the 5 GT, it brings a muscular bodykit, lowered M Sport suspension, bespoke 19-inch alloy wheels and various interior trim changes. Order any 5 GT before the end of March and you also get a free specification upgrade that includes Adaptive Drive adjustable dampers (usually 2265 extra). Whats it like to drive? Sadly, we cant tell you what the car is like on M Sport suspension, because Adaptive Drive deletes the lowered M Sport set-up and makes the car drive much like a regular SE-spec 5 GT that's equipped with Adaptive Drive. Still, this means body roll is tightly controlled, particularly when the car is in 'Sport' mode, and while there's a firm edge to the ride, it's never harsh. Just don't expect the car to feel that involving; its steering is too slow and you can sometimes lose track of where the front wheels are pointing. Our test car was a 530d. This is undoubtedly the pick of the range, because it's powered by a 3.0-litre diesel engine that averages over 40mpg and is the epitome of strength and smoothness. It also works beautifully with the standard eight-speed automatic gearbox. However, the 5 GT lets in a bit too much wind and road noise at motorway speeds. Whats it like inside? Heavily bolstered front seats and black rooflining give this M Sport model's cabin a sporty ambience. To this, the free specification upgrade adds desirable items such as nappa leather upholstery and a head-up display, but otherwise the interior is standard 5 GT. You have the raised driving position of an SUV and a wide range of adjustment to help you get comfortable, while plush materials and BMW's intuitive iDrive control system add to the appeal. It's just a pity rear visibility is so restricted due to the 5 GT's steeply sloping rear screen with blacked-out side sections. Rear legroom is on a par with the 7 Series limo, and only those north of six-foot will complain about headroom. However, the boot is disappointingly small a 5 Series Touring is a much better load-carrier. Should I buy one? The free specification upgrade that BMW is currently offering on all 5 GTs makes M Sport and SE models virtually identical to drive - all your extra 3300 buys is sportier looks. For this reason, wed be tempted to stick with SE spec. However, cars with Adaptive Drive ride and handle significantly better than regular SE models, so this is still a good time to buy a 5 GT. The generous standard equipment and classy, spacious cabin add further to the GTs appeal. The trouble is, BMW's 5 Series Touring also scores well in these areas, and its more practical, more efficient and significantly cheaper. It's where our money would go.